RChain is a blockchain project that aims to implement a scalable blockchain architecture that will allow applications built on RChain to scale to the level of large scale applications such as Facebook and Visa. 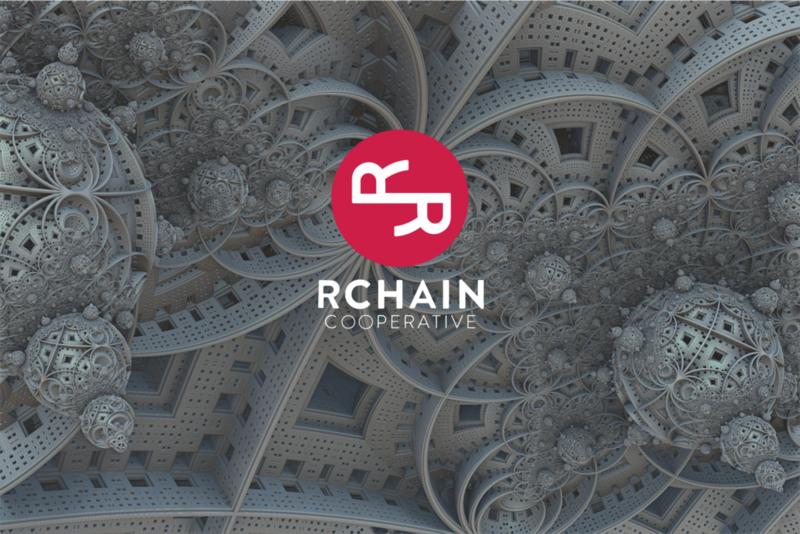 The project is managed by RChain Cooperative which is a decentralized organization within which members can vote on policies such as whether to hold an ICO or not. The project also has a for-profit arm to it — RChain Holdings. RChain Holdings is a company which aims to support and drive the adoption of RChain by nurturing startups and by providing consulting services. RHOC is an ERC20 token that is currently trading on some exchanges such as EtherDelta. With that said, since RChain is intended to be its own chain, it is likely that RHOCs will be tradable for their mainnet tokens called “REV” in the future. Since RChain will run a Proof-of-Stake (POS) algorithm as its consensus mechanism, RChain’s eventual token will be a staking token but will also be used to pay for the computational fees on the network. To reason about these fees, RChain introduces the idea of “Phlogiston” which is similar to the idea of “Gas” on ethereum and is dependent on the code that needs to be run to confirm the transaction. RChain then held a private sale which sold RHOC at around USD $0.20 with an intention to raise between $10 million and $15 million USD. It is unclear how many REVs will be present on their mainnet and it is unclear how many REVs the devs will keep for themselves. As a result of the above-discussed events, it is unclear how much funds RChain project has raised to date. The current market cap if fully diluted rests at around $120 — $140 million which will put RChain right around the top 50 coins by market capitalization. However, if we only look at the circulating supply, we are looking at a much more modest $25 million. Given the estimated September 2018 timeline for their “Mercury” platform release, this represents an annual burn of around $8 million which is on the high end. A significant amount of that expenditure is dedicated to development. This points to potentially large expansion in their development team and will be something to look out for in this project. To better understand the problem space that RChain is trying to compete in we need to take a look scaling blockchains in general. One yardstick by which to measure scaling in blockchains is TPS. However, TPS is only meaningful insofar as it is measured with real data. “Lab based” TPS and real-world TPS can vary drastically. To that end, RChain’s reported tens of thousands of TPS should be regarded as aspirational rather than a proven fact and solved problem. While RChain does discuss some of these in its documentation, they do not dive into much detail as to how RChain will specifically solve these problems. Milestone 4 is significant because it is roughly the milestone that will bring the RChain test net on par with Ethereum’s POS update called Serenity. There have been talks that Milestone 14 is many years (5+ years) away. The executional risk of the project is very high given the fact that they have such a long time frame to their main net launch and that the roadmap is so light on details. It is clear from its documentation that RChain is looking to compete with their main crypto chains — Ethereum and Bitcoin, with RChain being most similar to Ethereum because of its smart contracts and its approach to scaling. With that said, there are also other chains that it will inevitably end up competing with. Chains like NEO, Icon and even Dash and Ripple come to mind. In that sense, it is operating in a very crowded competition space each trying to carve out its niche. The RChain team is a fairly well-rounded team that seems to have the right mix of people to deliver on the technical side of a project like RChain. 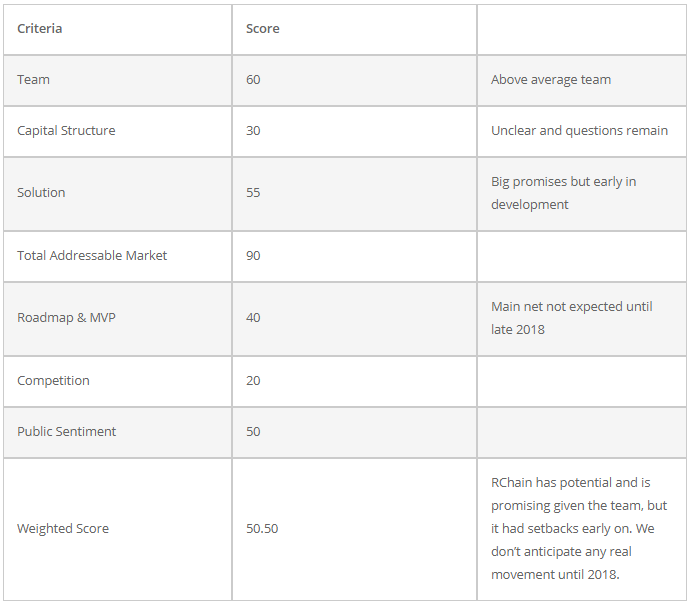 Overall RChain looks like they have a strong technical team and an above average non-technical team. However, their team does get weighed down by failed projects and some controversy. RChain is attacking a market that is huge. It has its eyes set on being one of the top crypto coins. The way it sees itself getting there is by offering a more scalable blockchain that can potentially provide the infrastructure needed to power large-scale applications. TPS is the most important metric touted by RChain, and it intends to reach a very high TPS number through a few commonly discussed methods and one slightly less discussed method. The less discussed method of concurrency will also likely be RChain’s killer feature when implemented. Concurrency is when a single large process can potentially be broken down into several smaller tasks to be computed before their outputs are recombined. This theoretically should give RChain an advantage over another blockchain that runs their code sequentially. RChain is looking to compete in the blockchain space by building a better and faster version of ethereum. Given the timeframe RChain is looking to launch, RChain realistically needs to be at least slightly disruptive to get a foothold in the market. On that note, its scaling strategies feel a little more incremental rather than disruptive. Most of the methods they are looking to implement in RChain have already been discussed for other projects like Ethereum. While the scalability numbers in their documentation paint a picture of a large gap where RChain is far ahead of its competitors, the fact is that RChain is comparing its aspirational product to the current (and near future versions) of Ethereum and Bitcoin. If we keep in mind that RChain only starts coming into its own around milestone 4 as mentioned, the important question here is whether we think that RChain will hit milestone 4 significantly earlier than Ethereum can deliver the serenity update. It is also important to note that RChain’s mainnet release is not until milestone 14. Given what we know of the ethereum roadmap toward POS, sharding, side-chains and state channels, RChain looks to be facing huge competition from the incumbent. In that sense, come the time for RChain’s mainnet deployment, RChain may not be delivering a much more scalable blockchain than the likes of Ethereum. In that light, RChain is essentially banking on its unique feature, concurrency. However, it is unclear how applications can or will be able to benefit from concurrency given that they will likely be tailored toward Ethereum’s non-concurrent implementation. To that end, I don’t see many applications jumping ship to RChain. It is likely that dapps will adopt a wait and see approach. While the team looks like they are technically solid, various members of their team have been caught up in quite a lot of controversy in the crypto community which does lead to a tangible impact on the reputation of the project. Listening to their recorded dev update meetings leads me to believe that their development team is comprised of very solid engineers. However, what is not clear is whether the project is solving the right problems that will lead to its success and if it was, whether it was doing it in a timeframe that would ensure its success. Another thing holding this project back is the history of their token as well as the uncertain economic model of their token. The fact that the circulating supply of RChain is not known, the fact that it is not clear how much RChain raised or if they are even doing another ICO, are red flags for the project. While developers and advisors can afford to distance themselves from the economics of the token, as investors we cannot. The fact that there is little to no clarity on their actual token model along with the fact that they might issue more (and different variations) of RHOC leads to a red flag in terms of the project’s crypto-economics. The project’s history with Synereo does not help it either. Add to that the fact that Ethereum will constantly be upgraded and iterated upon before RChain is released, RChain earns a score of 50.50. Which is the definition of an average investment in my books. This is not investment advice. While I have no position in RChain. I intend to pick up a small position shortly. Also, I have a position in Ethereum and Bitcoin which were the other tokens discussed in this analysis.